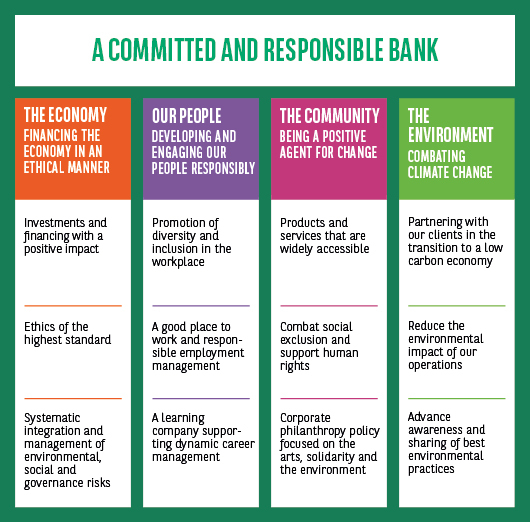 BNP Paribas is committed to organising the Group to build a sustainable future. Ethical principles, risk awareness and responsibility are the foundations of everything we do each day. The BNP Paribas Group has set itself the goal of raising the awareness of all its stakeholders – customers, employees, partners and also shareholders – as well as ensuring the company is fully engaged regarding sustainability issues. For this reason, the CSR strategy is based on four pillars: the economy, our people, the community and the environment. BNP Paribas is aware of its responsibility towards the markets and real economy in all matters of investment and financing. Ethical criteria are taken into account when making investment and credit decisions. The Group’s entities are also continuously developing their range of sustainable, ecological and socially responsible financial products. BNP Paribas’ success is based on its employees. Dealing with staff concerns responsibly is one of BNP Paribas’ core values. The Group therefore offers careers that further develop talent and capabilities in the best possible way. Diversity and inclusion are promoted in the workplace. 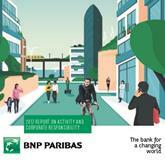 BNP Paribas continues to develop projects and models to reconcile the family and work-life balance. It promotes the well-being of all employees as part of active corporate health management. Responsibility towards society is very important for BNP Paribas. The bank supports initiatives that improve opportunities for children and young people through education and culture, thus contributing to reducing the effects of social barriers, in particular through the work of the BNP Paribas Foundation, founded in 2015 in Germany. Employees from BNP Paribas provide support where specific help is required as part of volunteering initiatives. Combating climate change and reducing the emission of gases that damage the climate are a top priority for BNP Paribas. Ecological criteria are resolutely taken into account when making decisions about financing and investment projects. BNP Paribas also sets specific targets for the reduction of its own consumption of resources. Employees contribute to the achievement of these targets through their environmentally-friendly conduct in the workplace. Since the end of 2017, BNP Paribas is CO2-neutral.